Holiday.gr - Lagada, a trip to a myth! Lagada is one of the three small villages of Aegiali worth to visit and see the important natural and religious sites. The village is built in a plain among the rocky mountain banks. It combines a hilly scenery with close distance to the sea. 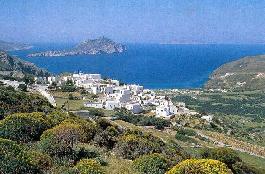 That's why is one of the most famous holiday destinations in Amorgos. The settlement follows the traditional architecture of Cyclades islands. When staying there visit Araklos' canyon and its wild beauty will impress you. Don't forget to visit the historical monastery of Trinity. Been to Lagada ? Share your experiences!